BRISTOL SHOW 2013: Rega reveals its first 'Skeletal' turntable, the RP8 | What Hi-Fi? There are plenty of vinyl fans here at the show, and desirable turntables to whet their appetities. None more so than the new RP8 from Rega, with its radical plinth design and three-piece laminated glass platter. "The RP8 represents probably the biggest step forward in the evolution of [founder] Roy Gandy's turntable design philisophies," claims Rega, which celebrates its 40th anniversary this year. Features include a new plinth using a polyolefin foam core which makes it seven times lighter than the original Planar 3 plinth, a new tonearm bearing assembly, a 24v low-voltage motor controlled by a hand-tuned electronic power supply, and a custom version of the Planar 9 hub bearing assembly. Key design objectives were to create a low-mass, high rigidity plinth combined with a low-vibration motor and lighter, more stable tonearm. 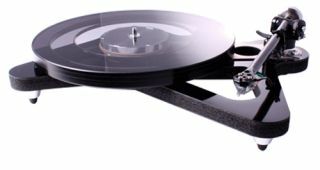 The standard Rega RP8 in black costs £1598, or you can specify it with the Apheta MC cartridge factory fitted for £2198. Both versions come with the TT-PSU power supply as standard.